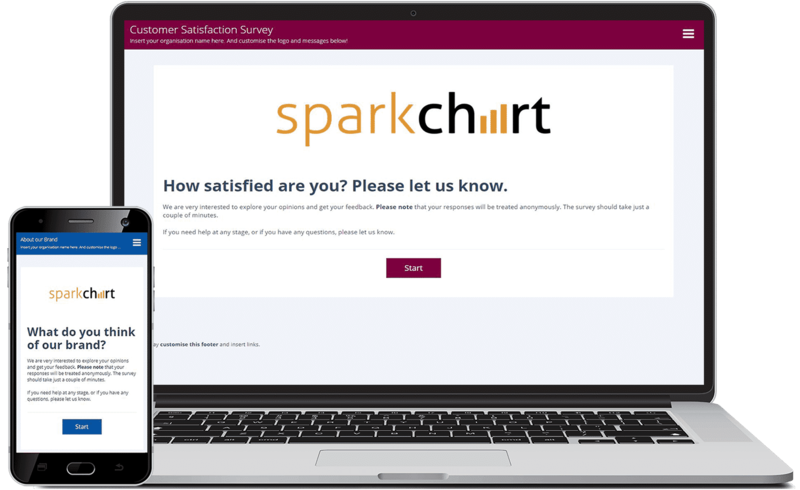 There are endless cases for using Spark Chart survey software. Organizations, businesses, consultants, freelancers, agencies and bloggers are using Spark Chart to get the valuable feedback they need for success. Any of our survey templates can be used as-is or customized. If you like, feel free to click Start to view any of the surveys. Aim: Identify customer perceptions of products or services, opportunities for improvement and how likely the customer is to recommend your products or services to others. Create your own survey now! Click here to start a free trial. Aim: To understand how people became aware of the brand, their overall perceptions of the brand and how likely they are to recommend it. Aim: To get feedback on various aspects of an event, including the relevance of the topic and content, the speakers, the venue and catering and the extent to which it met the expectations of those attending. Aim: To obtain feedback on the overall design, appeal, navigation and content of a website along with suggestions for improvement. Aim: To obtain feedback from users about their experience using software, including the New User Experience, the interface, support available, documentation, suggestions for new features or improvements and whether they are likely to recommend the software to others. Aim: Net promoter Sore is a commonly used index to measure a customer’s experience and the likelihood that they will recommend a product or service to a friend or others. Aim: To uncover the opinions and suggestions from parents and caregivers in a school community in a range of areas, including teaching and learning, student welfare, communication with the school community, systems, policies and processes and school leadership. Spark Chart has numerous use case examples and survey templates. We are adding new survey templates all the time. Here is a report example. If you prefer, click here to view the report in a stand alone browser window. Aim: To discover employee opinions on organizational strengths and weaknesses, along with suggestions, in a range of organizational areas, including role clarity, teamwork, leadership, systems & processes, customer service and the organization as a place to work. Aim: To quickly, and regularly, guage employee opinions on organizational strengths and weaknesses, along with suggestions for improvement in a range of key organizational areas. Aim: To explore the reasons for employees leaving an organization and to obtain information that will assist the organization to improve its workplace and retain quality employees. Aim: To seek team member views and opinions on how their team is performing in a range of areas and to identify team strengths along with opportunities for improvement. Aim: To seek the views and opinions of Leadership Team members on how their leadership team is performing in a range of areas and to identify team strengths along with opportunities for team and organizational improvement. Aim: To get feedback from members of a project team about the project leadership, how the project team is performing, the effectiveness of team communication and processes and to identify opportunties to improve the project. Aim: To help individuals or employees get feedback from people they work or collaborate with. Mostly, the feedback process is anonymous and confidential. The feedback process provides insight into where they may need to develop new skills, become more effective or change the way they behave, act or communicate. Aim: A SWOT Analysis (Strengths, Weaknesses, Opportunities & Threats) is typically performed as part of a strategic planning process. Strengths and Weaknesses are internal. Opportunities and Threats are external to the organization. The SWOT Analysis aids strategic decision making and provides a basis for identifying organisational priorities and action palns. Aim: To gather individual board member feedback, views and opinions on how the board is performing in areas such as governance, risk management, financial management, senior management relations, skills and decision making, along with opportunities for improvement.